Houses & Homes VA: Have You Ever Heard of "Cat Poop" Coffee? Have You Ever Heard of "Cat Poop" Coffee? Do you like gourmet coffee? I love a good cup of coffee and I can’t imagine working the long day of a realtor without at least one cup of Joe, well, until now that is. I have always thought that the local gourmet coffee shops here in Richmond have some of the best quality coffee around but that was before I heard of “Cat Poop”. Ummmm….. Yeah, cat poop. I’m not kidding. It has been said that the best coffee in the world comes from Indonesia and it’s called Kopi Luwak. This very rare coffee bean has been described by experts (coffee bean experts?) as possessing a very unique flavor that is mild and very smooth. There is the slightest hint of dark chocolate in its complex flavor and a certain secondary (but ever slight) taste of musk and earth. It is said that this rare blend of coffee is so extraordinary that even those of us that prefer cream and sugar in their morning boost would love this coffee black. When I first heard of this amazing drink I couldn’t wait to give it a try (if I could find it) but that was before I found out the secret to its unique flavor. The complicated and time consuming process required to “prepare” the rare beans includes the digestive system of an animal known as the Asian palm civet. 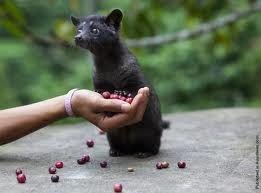 This furry little creature is the secret to the “unique” flavor of Kopi Luwak beans. In short, the creature swallows the beans whole and they are then “harvested” from its feces. They are then cleaned (I should hope so! ), fermented, dried and roasted. As you can imagine the entire process is incredibly time consuming. And the price? Well, I don’t know where to buy it here in Virginia but I do know that is sells for as much as $80 a cup in Japan and South Korea! If it costs that much in Asia, I wonder what it costs here? I was at a local well known coffee shop here in Richmond some time ago and I remember a few of the customers discussing that they thought the coffee was too expensive. I wonder what they would think if it were $80 a cup! I am very curious but I don’t think I have the courage (or the intestinal fortitude) to try a cup of Kopi Luwak. Aside from the cost I don’t think I could get past the unique “processing” required to produce this gourmet treat but I say “to each his own”!